I purchased these for table favors at our company holiday party. Everyone loved them....they thought they were beautiful! I loved the quality and the price. Very pretty etched glass with snowflake design. Individually wrapped with a white ribbon. Perfect for giving to guests who attend your holiday party. Quality is high, looks very high end. 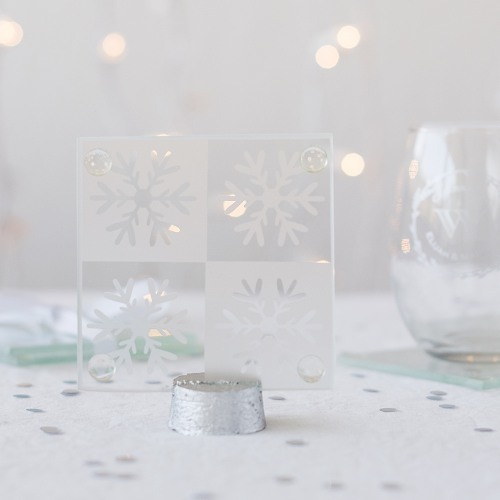 Beautify your winter or holiday-themed party with these gorgeous snowflake-themed coasters. These coasters pull double duty, adding a special wintery touch to your décor while protecting table tops. Coasters come gift-wrapped in sets of two, and each coaster features an elegant snowflake pattern. Present them to guests as collectible favors, or unwrap and arrange them on tables for an easy way to bring the beauty of winter to your place settings.